I started my digital painting class earlier this week, and it’s been quite enlightening. The first exercise was “basic” brushwork – a review for many students, but not for me! I learned more about Photoshop brushes in those three hours than in five years of using Photoshop for weave design. Hurray! Aside from the exercises, we’re also expected to turn in a more creative project in three weeks. 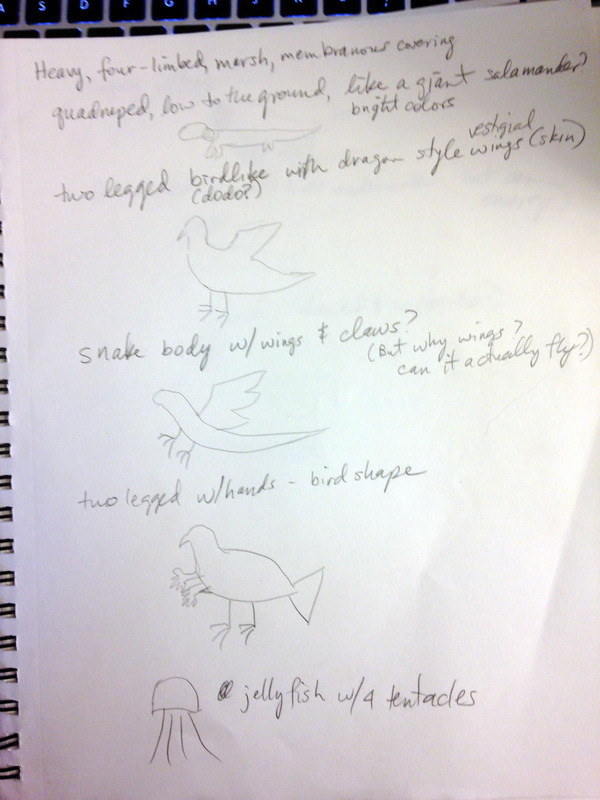 This one is designing a fantasy animal that is appropriate for its environment – the more creative, the better. For next week, we’re just handing in preliminary sketches. This was a great opportunity to play Design Poker, a game I cobbled up for my book. It’s an adaptation of “The Design Game,” from Ideas in Weaving, by Ann Sutton and Diane Sheehan. Basically, you take a deck of ideas, draw at random, and generate a bunch of designs from those ideas. In this case, I used a deck with four types of ideas: weight of the creature (lightweight/heavyweight), number of limbs, terrain where it lives, and its covering (skin, scales, feathers, etc.). Here’s the result of the first round, which was more about generating ideas than sketches (click to read the larger version). 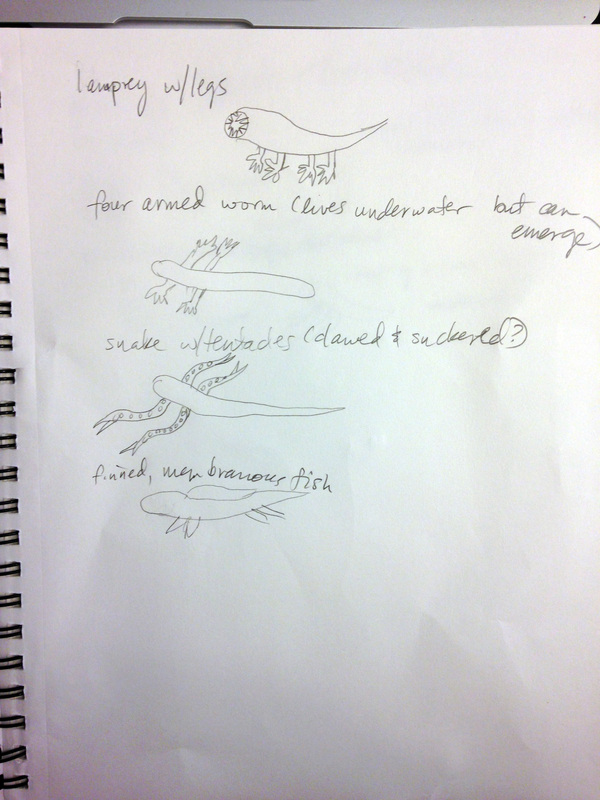 The ideas I drew were “heavy”, “four-limbed”, “marsh”, “membranous covering” (e.g. salamander skin). If you look closely you can see that not everything fits 100% into those ideas. That’s fine – the idea is to brainstorm designs with help from constraints, not to follow the rules of Design Poker. But the general thrust is creatures that could live in a marsh and have four limbs. Of these ideas, my favorites are mostly the later ones, which is not surprising since the last 1/3 of the results of a brainstorming session are usually the most interesting ones. (At first, you come up with obvious ideas – it’s only once you start running out of easy ideas and are grasping at straws that really creative stuff comes to light.) I’m particularly fond of the lamprey with legs (now there’s a frightening idea! ), the four armed worm that lives in water mostly but can emerge if needed, and the snake with tentacles. I also kinda like the idea of the jellyfish that can walk on its tentacles – another of those creepy concepts. I’m in the middle of another round of Design Poker, but with a simplified set of ideas. The concepts for this round are “six limbs” and “grassland”. So far I’ve got a six-armed snake with a lamprey head (think “sandworm with arms”) and a few cliches (centaur, pegasus, harpy, etc. ), but I’ve only just started. I’m sure better ideas will come later on, when I’ve exhausted the obvious possibilities. You’ll notice that my sketches are basically stick figures. I anticipate some trouble when it comes time to do the actual sketches – most notably that I’ve never tried sketching an imaginary object in any detail before – but I’ll cross that bridge when I get there. The first step is to find ten ideas that I like, and then start developing them into sketches. first handspun skein in 12 years! It’s not obvious from the skein, but the yarn is a smooth color gradation starting at yellow and ending at navy blue. It’s destined to be a sock – hopefully a beautiful one! 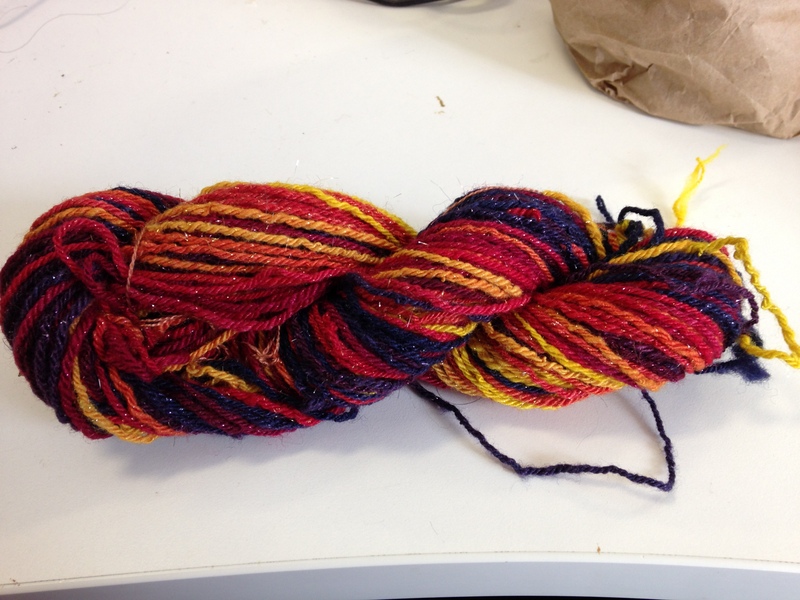 I’m quite pleased with my skein. The yarn is pretty consistent in diameter, and the skein hangs straight, which means the spinning and plying twist are balanced. That is relatively easy to manage on a wheel, where you can count revolutions of the wheel to track the amount of twist, but is a bit harder on a spindle since you basically have to work by feel. Anyway, I think it’s great for a “returning-to-spinning” skein, especially for one done on a drop spindle while walking about. I’m very pleased with it and can’t wait to spin the other sock! That is not quite complete – I also have a KCL spindle and another small Golding ring spindle, but they were off partying somewhere and didn’t make it for the photo shoot. 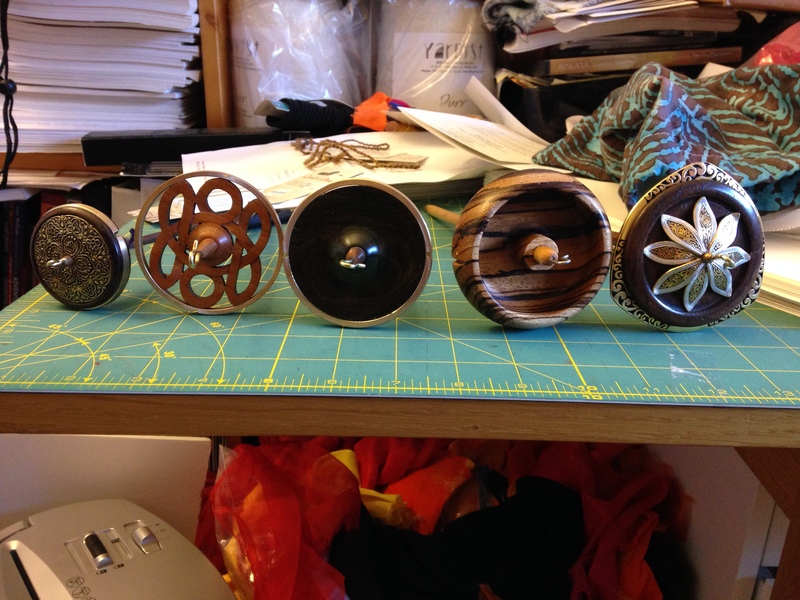 The veteran spinners amongst us may note that four of the five spindles are Golding ring spindles. That is not a coincidence; they make the best spindles I’ve ever encountered. Perfectly balanced, and rim-weighted so they spin for a very long time. And they’re beautiful! And in cat-land? Mike, dastardly being that he is, is trying to get them hooked on the heavy stuff. 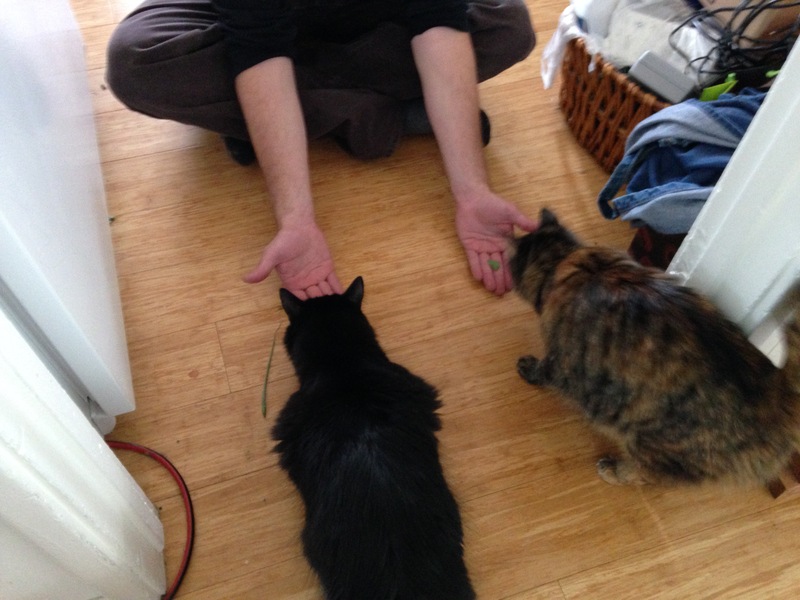 Here they are, investigating fresh catnip for the first time. Fritz was fascinated but largely unaffected; Tigress, on the other hand, was sniffing at it, rolling on it, and rubbing her head against the floor. I wish I’d gotten a video of that! That yarn is so impressive. I’ve know people who haves spun for years and couldn’t do that walking. You’ll make that blanket yet.